. Published on October 27, 2014 . 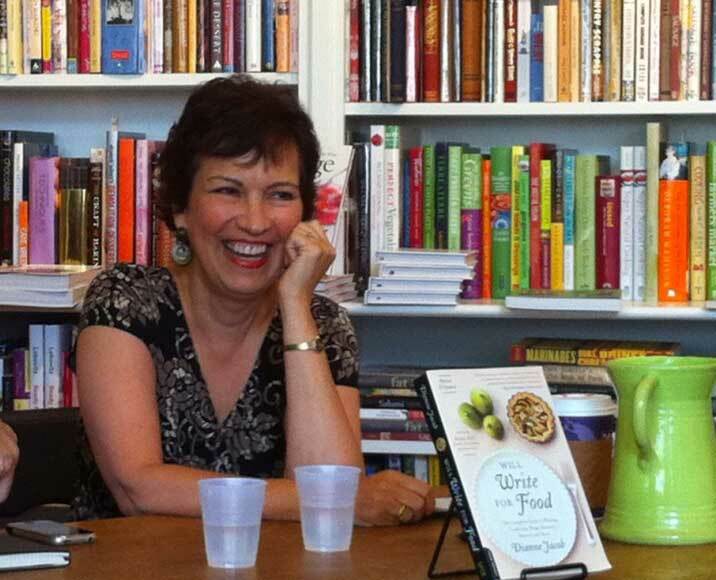 Dianne Jacob is an award-winning author and writing teacher; she won the Cordon D’Or International award for Best Literary Food Reference Book in 2005 the Gourmand World Cookbook Award in 2010 for Will Write for Food: The Complete Guide to Writing Cookbooks, Blogs, Reviews, Memoir, and More. Jacob covers food writing trends and technique, including recipe writing and blogging, on her blog which is must-reading for anyone interested in food writing and publishing. As if that weren’t enough, Jacob also has a lively speaking and teaching scheduling, and helps other writers through her coaching and editing business. Jacob shared interesting insights about how she organizes her day and her approach to procrastination. When I’m not traveling to teach or speak, I am at my desk for up to 12 hours a day. I have a good idea of what I have to accomplish. I am a list maker of big deadlines and things I don’t want to forget, but I don’t make a daily list, because there would be too many things on it and I would freak out! I try to handle email and calls in the morning, and then work on my own projects in the afternoon. I also make time to exercise almost every day. I have regular classes to go to at the beginning and ends of the day, plus hikes in my hilly neighborhood both alone and with friends. They’re good for raising the endorphins and getting me out of my routine. Sometimes I regret that I have streamlined my life to spend a great deal of it working, but on the other hand, I love my work! It makes me happy to wear lots of hats, all based on helping or inspiring other writers. I am a speaker, teacher, coach, editor, writer and blogger. I like the variety, particularly because I work long hours. I couldn’t do just one thing. Even when I am writing a book, I can’t do it all day long, every day. It’s exhausting. I’ve been trying to write 1000 words per day right now, for a new chapter in Will Write for Food. Some days I do it and other days I burn out or there’s too much distraction. But with planning, I have allowed myself time to accumulate all that I have written and edit it together into something cohesive, and the chapter is coming together. I made an outline, which serves as a great starting point. I just go where ever I want and start filling in, like a coloring book. When I went to journalism school there was no such thing as writer’s block. You had to do the work because the editor scheduled the stories to appear in the paper. But now, as a self-employed writer and editor, I have succumbed to self doubt about whether anyone really cares. It is much riskier to write about yourself than to report about other people or events. It’s also riskier than writing how-to blog pieces, which is what I do on my blog and it’s the focus of my book. I try to disconnect from the internal critic and keep going. I joined a writing group, which forces me to submit work and have it graciously received and edited. Since joining the group, I have even had a piece published on the website of a prestigious national magazine, which thrills me. For the first time, I am more focused on the process than on being published, and taking my time. Regarding quality work, just the process of getting something down on paper is an accomplishment. Then comes the reshaping and polishing. Yes. I want to keep going and get my stories down. I get a good response from my writing partners and that motivates me to polish existing drafts and write new ones. Regarding motivation, I have to believe that I have something important to say and to share with the world. If I don’t start with that, I can’t write. Oh gosh, there are so many people who are more fearless, more productive, and better writers than I. It would be a very long list. As to what inspires me, probably the courage of writers who bleed onto the page, or who write lyrical prose and stories where I want to just forget everything else and drown myself in their work. I’m not so interested in writers’ process, about such details about what time of the day they write and how much. I have been a working writer since 1976, so I’m pretty clear about what I need to get done and how. I do, however, love to read about how their minds works when crafting a story. I can never get enough of that. There’s always some kind of takeaway that I can apply to my work or my blog. My personal heroes are Nora Ephron and Gloria Steinem. Otherwise, I try to be patient, kind, and in the moment. Meditation helps with that. Walk: in your neighborhood, at a park; alone or with friends: make time every day to stretch your legs and get some perspective. Meditate: the habit that supports all your other habits.